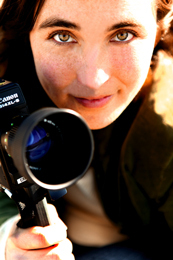 Sarah Van Borek is a filmmaker, musician, artist and educator dedicated to global citizenship, collaboration and responsiveness to contemporary issues. She has an MFA in Film & TV from the University of Cape Town, South Africa and teaches in Social Practice and Community Engagement at the Emily Carr University Art + Design. Sarah loves to ride her bike, especially on the seawall in Vancouver. Through this project she continues to learn about the various parts a bike are made of and all the fun things you can do with them.